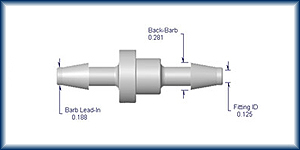 the flow direction and instantaneous check once flow is stopped and reverse flow is sensed. 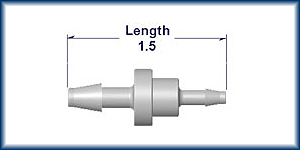 Duckbill Check Valves will react, and hold in check, pressure as low as 0.5 PSI. This design utilizes a smaller valve body for use where minimal space is required. Duckbill CV’s are available in 1/8” and 3/16” barb size, and can be purchased as Standard (same size), Reducing, or Enlarging. 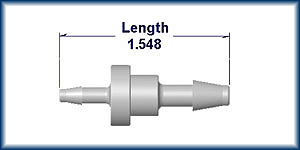 Duckbill Check Valves share our standard Check Valve barb design, a barb molded without a parting line. A very sharp seal point on the barb seals securely with flexible tubing and has been tested to hold pressure up to 150 PSI without the use of a hose clamp. Duckbill Check Valves feature a silicone valve with body material options of Nylon, Polypropylene, Kynar®, and Polycarbonate.